Local anesthetics alone for supraclavicular brachial plexus block provide good intraoperative conditions but produce a shorter duration of postoperative analgesia. Various adjuvants are in use to hasten the onset of the block and prolong the duration of postoperative analgesia such as tramadol, butorphanol, buprenorphine, α2-adrenergic agonists, and dexamethasone. Opioids have synergistic action with local anesthetics, and thus, their addition to bupivacaine prolongs the duration of analgesia and improves the quality of block. Butorphanol is a synthetic opioid-like morphine having partial antagonistic activity at μ receptors and agonistic activity at kappa receptors. The role of butorphanol as an adjuvant to local anesthetic agents in upper limb peripheral nerve blocks has been extensively studied. Dose range of 20 μg/kg has been used in various studies. Some authors concluded that up to 2 mg doses has been associated with minimal side effects. Besides, there is no study suggestive of any appropriate dose of butorphanol as an adjuvant in supraclavicular brachial plexus block. Hence, the present study was planned to evaluate the duration of analgesia of two different doses of butorphanol, 1 and 2 mg added to 0.375% levobupivacaine, in patients posted for elective upper limb surgeries under supraclavicular brachial plexus block. Our study also sought to assess the onset and duration of sensorimotor blockade and adverse effects in both the groups. Eighty patients undergoing elective orthopedic surgeries of elbow, forearm, and hand under supraclavicular brachial plexus block were randomized into two equal groups based on block randomization. Patients belonging to American Society of Anesthesiologists physical status 3, 4, and 5, patients with history of significant neurological, psychiatric, neuromuscular, cardiovascular, pulmonary, renal or hepatic disease, with history of alcohol or drug abuse, pregnant or lactating women, patients receiving chronic analgesic therapy, with morbid obesity (body mass index >35 kg/m2), patients with coagulation disorders and patients on anticoagulation therapy and refusal by patient to enlist in the study were excluded. The study protocol was approved by the institutional ethical committee. Written informed consent was taken from each individual willing to enter the study. Preanesthetic checkup and routine investigations such as complete blood count, serum creatinine, and electrocardiogram (ECG) were done. Patients were kept nil by mouth for 6 h. All patients were clinically examined in the preoperative period, and the whole procedure was explained. 10 cm visual analog scale (VAS) (0, no pain and 10, worst pain imaginable) was also explained during the preoperative visit. All patients received tablet clonazepam 0.5 mg orally on the night before surgery. Eighty ASA physical status I and II patients undergoing elective orthopedic surgeries of elbow, forearm, and hand were randomly assigned to one of the two groups: Group LB1 received 29 ml of 0.375% levobupivacaine plus 1 mg of butorphanol diluted in 1 ml of normal saline (total 30 ml). Patients in Group LB2 received 29 ml of 0.375% levobupivacaine plus 2 mg of butorphanol diluted in 1 ml of normal saline (total 30 ml). After shifting the patient into operation theater, intravenous (IV) line access was established using 18-G cannula. All noninvasive monitors such as noninvasive blood pressure, pulse rate, oxygen saturation (SpO2), and ECG were applied to all patients, and their baseline vital signs were measured. All patients were provided with supplemental oxygen using nasal cannula at 2 L/min. Patients were sedated with IV administration of midazolam 1 mg and fentanyl 30 μg before the block. A nerve stimulation technique with a Stimuplex© needle (B Braun 22G, 5 cm) and a stimulator were used. After desired motor response with stimulating current of <0.4 mA (2 Hz, 0.1 ms duration), the local anesthetic solution was injected in incremental 5 ml boluses with intermittent aspiration. Sensory and motor blockade were assessed every 2 min after completion of injection till 30 min and then every 30 min after the end of surgery till first 12 h, thereafter hourly until the block had completely worn off. For sensory loss assessment, we used pinprick test with a three-point scale: 0 – no block, 1 – analgesia (loss of sensation to pinprick), and 2 – loss of touch. Motor blockade was evaluated by the ability to flex the elbow and hand as: 0 – full flexion/extension movement in hand and arm against resistance, 1 – movement against gravity but not against resistance, 2 – flicker of movement in hand but not in arm, and 3 – no movement (complete motor block). The onset of sensory blockade was defined as the interval between the end of injection and sensory blockade and was demonstrated as loss of sensation to pinprick or by score of 1 on pinprick response. The onset of motor blockade was the interval between the end of injection and complete motor paralysis of wrist and hand. The duration of sensory blockade was defined as the time interval between sensory blockade and reappearance of pinprick response. The duration of motor blockade was defined as the time interval between maximum motor blockade and complete movement of wrist and fingers. 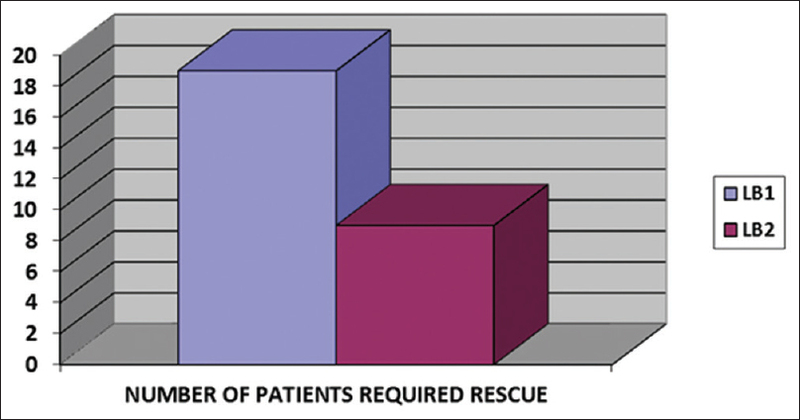 Duration of analgesia was taken as the time interval between the onset of sensory blockade and the first dose of rescue analgesic given to the patient. A complete block was defined as one associated with Grade 2 sensory anesthesia and Grade 3 motor block, and only these patients were included for further study. Patient with sensory block of Grade 0, 1 and motor block of Grade 0, 1, and 2 were considered to have incomplete block and hence were excluded from further analysis and converted to general anesthesia. Postoperative pain was assessed using VAS (0 – no pain to 10 − worst pain) every hour till the block lasted. Postoperative vitals (heart rate [HR], systolic blood pressure [SBP], diastolic blood pressure [DBP], mean arterial pressure [MAP], and SpO2) were recorded every 2 h for the first 6 h and thereafter every 4 h till the need for rescue analgesia. Rescue analgesia was provided with injection diclofenac sodium 75 mg intramuscularly when VAS ≥3 cm. Number of diclofenac injections given to each patient during first 24 h of the postoperative period was recorded. The time between the complete sensory block and the first analgesic request was recorded as duration of analgesia. Patients were observed for any incidence of hypotension, bradycardia, fall in peripheral SpO2, any discomfort, nausea, vomiting, shivering, pruritus, pain, or any other adverse effect and were managed according to clinical protocol. Sample size calculation was done based on a pilot study of ten patients (5 in each group). The duration of analgesia in pilot study in two groups was 670.9 ± 118.2 min and 530.2 ± 121.4 min, respectively. To detect an observed difference of 2 h in duration of analgesia between the groups, with a Type 1 error of 5% and a power of 80%, the minimum sample size required was 37 in each group. We included 40 patients in each group for better validation of results. Data were checked, entered, and analyzed using SPSS version 19 for Windows (Armonk, NY, USA: IBM Corp). Quantitative data were represented as mean ± standard deviation and for qualitative data, number and percentages were used. Student's t-test was used as test of significance to find an association for quantitative data. Chi-square test was used as test of significance to find association for qualitative data. P < 0.05 was considered as statistically significant. Supraclavicular brachial plexus block was performed in eighty patients, posted for elective upper limb surgeries, out of which two (one from Group LB1 and one from Group LB2) were excluded due to incomplete/failed block effect [Figure 1]. A total of 78 patients (39 in each group) were included in the study. There was no statistically significant difference in demographic parameters (age, height, and weight) [Table 1] and mean duration of surgery in the two groups. Baseline vital signs (HR, SBP, DBP, MAP, SpO2, and sedation score) were also comparable in both the groups. [Table 2] shows the type of fractures in the studied patients. fracture both bones forearm was the most common fracture with total of 35 cases (17 in Group LB1 and 18 in Group LB2), followed by fracture lower end of humerus with 25 cases (13 in Group LB1 and 12 in Group LB2) and was comparable statistically. Indications for different upper limb orthopedic surgeries were also similar and have no statistical significance (P > 0.05). The sensory and motor block onset was significantly faster in Group LB2 than in Group LB1. The mean sensory block onset time was 8.04 ± 0.65 min in Group LB1 as compared to 12.57 ± 3.5 min in Group LB2 (P = 0.032). The mean motor block onset time was 16.76 ± 13 min in Group LB1 as compared to 14.3 ± 1.2 min in Group LB2 (P = 0.026) [Table 3]. The duration of sensory block was prolonged in Group LB2 (521.67 ± 71.3 min) when compared to Group LB1 (396.23 ± 90.5 min) (P = 0.001). The duration of motor block was also prolonged in Group LB2 (418.40 ± 73.8 min) when compared to Group LB1 (305.60 ± 66.6 min) (P = 0.001) [Table 3]. The duration of analgesia was significantly prolonged in Group LB2 (643.55 ± 131.6 min) when compared with Group LB1 (511.73 ± 128.6 min) (P = 0.001) [Table 3]. About 19/39 patients (48.7%) in Group LB1 required diclofenac sodium injection as rescue analgesia, whereas 9 out of 39 patients (23.1%) in Group LB2 required rescue analgesia in the first 24 h of postoperative period [P = 0.037; [Figure 2]. The incidence of adverse effects, namely sedation, nausea, vomiting, and pruritus (P < 0.05) were significantly higher in Group LB2 compared with Group LB1 [Table 4]. No patient was developed respiratory depression, hypotension, and bradycardia. Results of this prospective, double-blinded study show that addition of 2 mg butorphanol to 0.5% levobupivacaine produces longer duration of analgesia compared to 1 mg butorphanol in patients posted for upper limb surgeries under supraclavicular brachial plexus block. The higher dose of butorphanol also hastens the onset and prolongs the duration of sensory and motor block. Fewer patients (48.7%) in Group LB2 required diclofenac sodium injection as rescue analgesic than patients (23.1%) in Group LB1. Butorphanol can be used alone or in combination with a local anesthetic agent, for brachial plexus block. Butorphanol is a synthetically derived opioid agonist-antagonist analgesic of the phenanthrene series. It exhibits partial agonist and antagonist activity at the μ opioid receptor and agonist activity at the kappa receptor. Stimulation of these receptors on central nervous system neurons causes an intracellular inhibition of adenylyl cyclase, closing of influx membrane calcium channels, and opening of membrane potassium channels. This leads to hyperpolarization of the cell membrane potential and suppression of action potential transmission of ascending pain pathways. Dose of levobupivacaine was selected from previous studies. Even we had selected a slightly lesser dose of drug to be on a safer side. Ambi et al. had chosen 36 ml of 0.5% levobupivacaine for perineural ultrasound-guided axillary brachial plexus block, and here, we have taken 30 ml of 0.375% levobupivacaine. The dose of levobupivacaine used in our study is 29 ml of 0.375% thus being equal to 108.75 mg of bupivacaine which is well within the maximum recommended dose of bupivacaine. Gupta et al., in their studies, used 2 mg butorphanol in the lumbar epidural route safely without any significant complication. Again, the blood concentration of anesthetic drugs after various routes of administration reveals that drug concentration is the highest after intercostal nerve blockade, followed in order of decreasing concentration by injection into caudal epidural space, lumbar epidural space, brachial plexus, and subcutaneous tissue. Thus, any drug used in brachial plexus blockade is associated with a lower risk of absorption and side effects than administered epidurally. Hence, we had chosen 2 mg butorphanol for the use in brachial plexus block. While writing this discussion, we have found the reference of much higher dose (3 mg) of butorphanol used through epidural route in lower limb surgeries with effective intraoperative sedation and prolonged postoperative analgesia without fear of respiratory depression. In our study, the onset of sensory and motor block was earlier with the higher dose of butorphanol (2 mg). Pokharel et al. reported that the addition of butorphanol to local anesthetic in epidural route produces earlier onset analgesia and times to reach peak analgesia. They also found that higher dose of butorphanol also hastens the onset of analgesia compared with lower dose. Similar results were also observed by Dhimar et al. They found that higher dose of butorphanol provides faster onset and peak effect with longer duration of analgesia postoperatively. In our study, the duration of sensory block (521.67 ± 71.3 min in Group LB2 vs. 396.23 ± 90.5 min in Group LB1) was significantly increased in LB2 group than in the LB1 group (P = 0.001). The duration of motor block (418.40 ± 73.8 min in LB2 Group vs. 305.60 ± 66.6 min in LB1 Group) was also significantly prolonged in LB2 Group than in LB1 Group (P = 0.001). These results were very similar with Kumar et al. who reported that, in subarachnoid route, sensory and motor blocks were significantly prolonged in butorphanol-treated group while compared with fentanyl group. In our study, the duration of analgesia was 643.55 ± 131.6 min and 511.73 ± 128.6 min in LB2 and LB1 groups, respectively. The duration of analgesia was significantly (P = 0.001) prolonged in higher dose butorphanol group. However, Kulkarni VR reported that perineural injection of butorphanol with bupivacaine can provide early onset of sensory and motor blockade. There is hardly any difference in-between the onset of action between the doses 30 μg/kg and 40 μg/kg of butorphanol, but sedation is an unavoidable side effect with 40 μg/kg. In our study, patients of LB2 group required significantly less number of diclofenac sodium injection as rescue analgesia in the first 24 h of the postoperative period than the patients of LB1 Group (P < 0.05). Wajima et al. also observed that rescue analgesic requirement was significantly decreased with higher dose of nalbuphine when administered in continuous brachial plexus block. In our study, we did not observe shivering or respiratory depression in any patient. Other studies of epidural butorphanol for postcesarean analgesia have also reported either a complete absence or a very low incidence of such side effects. In fact, prophylactic administration of butorphanol has been recommended for prevention of such side effects produced by pure agonist opioids such as morphine, and it has also been effectively used for the treatment of intractable pruritus associated with dermatological conditions. Further routine administration of injection prophylactic ondansetron in obstetric patients contributes in decreasing the incidence of nausea and vomiting. However, the incidence of sedation was significantly higher in Group LB2 compared with Group LB1. There was no incidence of any complication in the study done by Wajima et al. with butorphanol which correlates with our study. One limitation of our study was the absence of control group. The inclusion of control group would have further supported our findings. We also recognize the fact that the wide variability in the age of the patients included in the study is a confounding factor in relation to perception of pain as pain perception varies for various age groups. The major drawback of our study was the unavailability of ultrasound in our institute, which is another great drawback of this study. Two milligrams of butorphanol added to levobupivacaine in brachial plexus block produces a longer duration of analgesia than one milligram. The higher dose also hastens the onset and prolongs the duration of sensorimotor blockade. Higher dose of butorphanol produces higher incidence of sedation, which requires close monitoring. Bruce BG, Green A, Blaine TA, Wesner LV. Brachial plexus blocks for upper extremity orthopaedic surgery. J Am Acad Orthop Surg 2012;20:38-47. Chiruvella S, Konkyana SK, Nallam SR, Sateesh G. Supraclavicular brachial plexus block: Comparison of varying doses of nalbuphine combined with levobupivacaine: A Prospective, double-blind, randomized trial. Anesth Essays Res 2018;12:135-9. Foster RH, Markham A. Levobupivacaine: A review of its pharmacology and use as a local anaesthetic. Drugs 2000;59:551-79. Nishikawa K, Kanaya N, Nakayama M, Igarashi M, Tsunoda K, Namiki A, et al. Fentanyl improves analgesia but prolongs the onset of axillary brachial plexus block by peripheral mechanism. Anesth Analg 2000;91:384-7. Acharya R, Jena M, Mishra S, Rath SK. Effect of butorphanol versus placebo as an adjuvant to bupivacaine for supraclavicular brachial plexus blockade. Int J Appl Pharm 2014;6:8-10. Kapse US, Bhalerao PM. 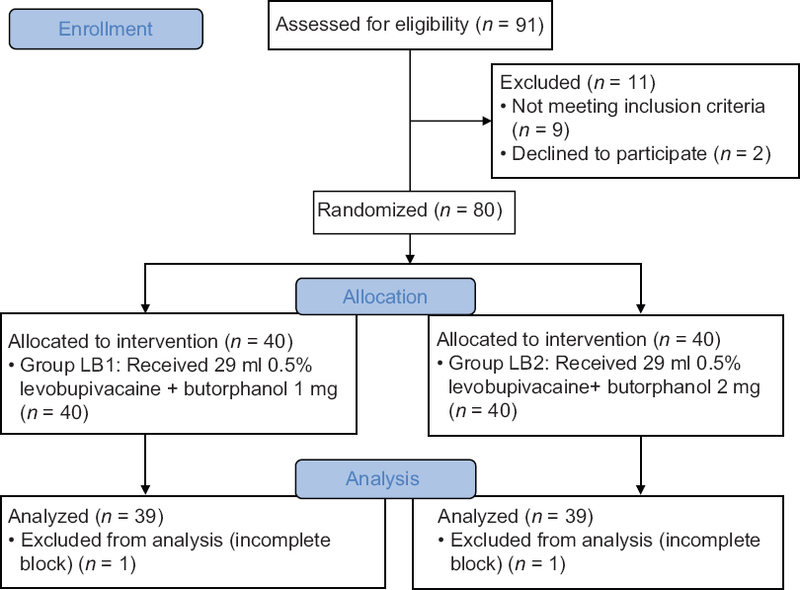 Comparison of bupivacaine with fentanyl and bupivacaine with butorphanol for brachial plexus block by axillary approach – A prospective, double blind, randomized study. Int J Res Med Sci 2017;5:1415-8. Sharan R, Singh M, Attri JP, Singh D. Additive effect of butorphanol in supraclavicular brachial plexus block. Int J Med Res Rev 2016; 4:910-7. Wajima Z, Shitara T, Nakajima Y, Kim C, Kobayashi N, Kadotani H, et al. Comparison of continuous brachial plexus infusion of butorphanol, mepivacaine and mepivacaine-butorphanol mixtures for postoperative analgesia. Br J Anaesth 1995;75:548-51. Leone S, Di Cianni S, Casati A, Fanelli G. Pharmacology, toxicology, and clinical use of new long acting local anesthetics, ropivacaine and levobupivacaine. Acta Biomed 2008;79:92-105. Gupta R, Kaur S, Singh S, Aujla KS. A comparison of epidural butorphanol and tramadol for postoperative analgesia using CSEA technique. J Anaesthesiol Clin Pharmacol 2011;27:35-8. Dhimar AA, Patel MG, Swadia VN, Desai DJ. Epidural butorphanol: Comparison of two different doses for lower limb orthopedic surgery. J Anaesth Clin Pharmacol 2006;22:47-52. Pokharel K, Rahman TR, Singh SN, Bhattarai B, Basnet N, Khaniya S, et al. The efficacy and safety of low dose epidural butorphanol on postoperative analgesia following cesarean delivery. JNMA J Nepal Med Assoc 2008;47:57-61. Kumar B, Williams A, Liddle D, Verghese M. Comparison of intrathecal bupivacaine-fentanyl and bupivacaine-butorphanol mixtures for lower limb orthopedic procedures. Anesth Essays Res 2011;5:190-5. Wajima Z, Nakajima Y, Kim C, Kobayashi N, Kadotani H, Adachi H, et al. IV compared with brachial plexus infusion of butorphanol for postoperative analgesia. Br J Anaesth 1995;74:392-5. Rai S, Verma S, Pandey HP, Yadav P, Patel A. Role of butorphanol and ondansetron premedication in reducing postoperative shivering after general and spinal anesthesia: A randomized comparative study from North India. Anesth Essays Res 2016;10:319-23. Maheshwari SB, Shah KS, Chadha IA. Tramadol and butorphanol for control of shivering: Randomized double blind comparative study. J Anaesthesiol Clin Pharmacol 2008;24:343-6.